First published in 1990, this book is a comprehensive study of Gramsci's Quaderni, and gives the reader a penetrating account of the structure of Gramsci's thought. The author draw on many materials and sources, making accesible to the English-speaking reader a wide range of texts otherwise only available in Italian, French, Spanish, and Catalan. 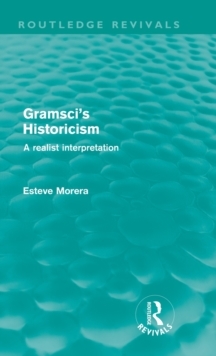 His book sheds light on Gramsci's basic philosophical and methodological principles, and will be useful as an introduction to Gramsci for students of political science, sociology, social science, history, and philosophy, as well as to scholars in the field.